There's also a fab prize to be won (randomly) for those who enter a proper project. This month 3rd Eye are our generous sponsor and they also offer a 10% discount code for the whole month to use for our readers! Find out more about it here. This fabulous alteration was done by fabulously talented Nicole from Canadian Nickel Scrap'n! Adorable, isn't it? Please, feel free to take the badge for display on your blog, Nicole! And thank you so much for sharing your awesome creations with us! Servus and welcome back to the promised announcement of our sponsor for this month's challenge and the additional inspirational project that is meant to get your mojo flowing. Lovely Drycha from 3rdEye store is with us again and providing us with a fab give-away for one lucky winner (whom we will randomly draw from all proper entries with the April challenge)! 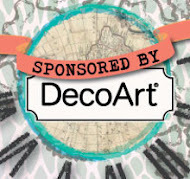 She also generously offers a 10% discount code for all of our readers who want to shop with her online store! 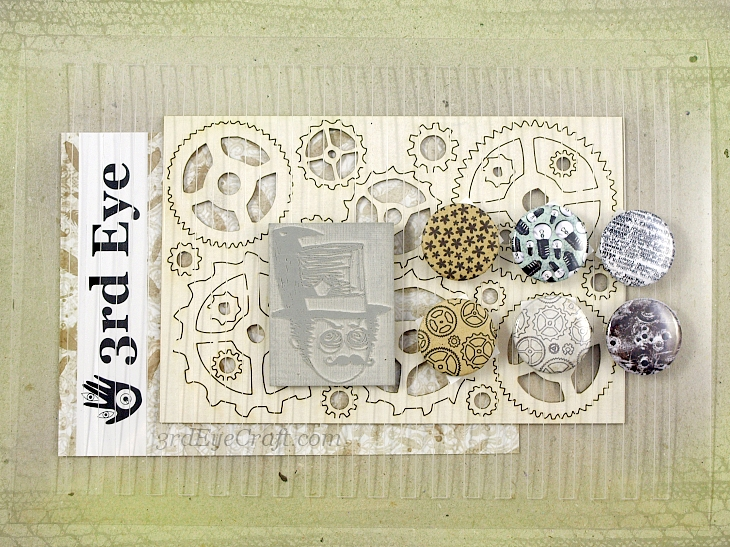 You just have to fill in the code "STEAMPUNK" in the window for codes during placing an order. This code is valid until the end of April. It is for 3rd Eye goodies only, not for classes. Rikka said: "I thought about the technique a long time. I use many techniques, but what's my favorite one? Then I decided to use my all time "go to" technique - adding some masking tape to the background, spreading a coat of gesso on top and coloring the surface with mists. 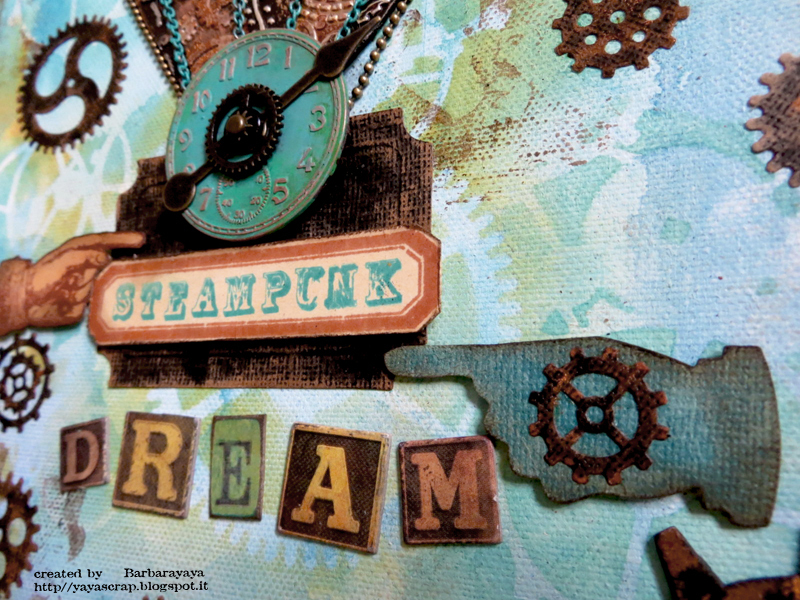 To add a little steampunk there I went with nostalgic tones, used a light bulb printed washi together with the masking tape and added some alcohol ink to the mix. 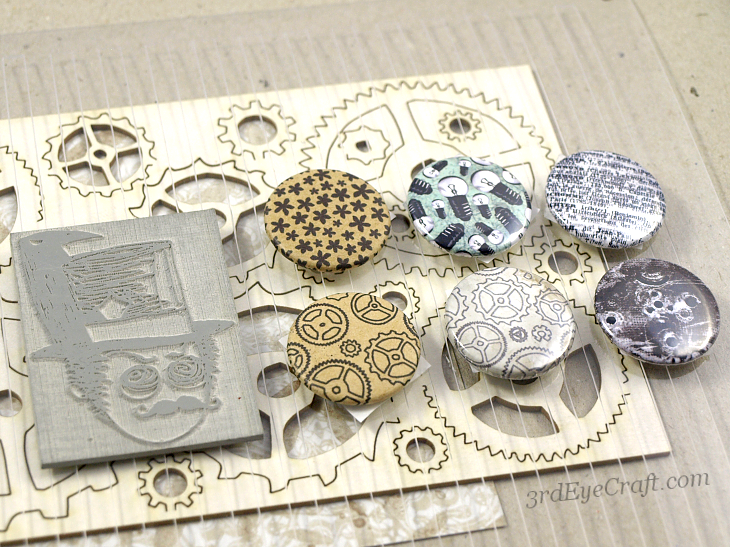 To get the page more grungier I then added some modelling paste to the corners and stamped to the wet medium using a cogs stamp by 3rd Eye. Black splashes, clocks, mesh tape and a huge wing finish the look." It's sooo beautiful, isn't it? Thank you, Rikka and Drycha, for being with us this month and helping us make this place so special! If you haven't already read this month's challenge post you can find it (along with some awesome inspiration from "my" fab DT) over here. If you haven't played with us before I would kindly ask you to read the general rules stuff first - I really hate to exclude and delete improper entries as we know that a lot of love and labour has gone into them. But we have to be fair to all those who take the time and follow the rules. 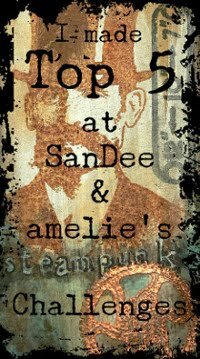 Welcome back to our little Steampunk corner! 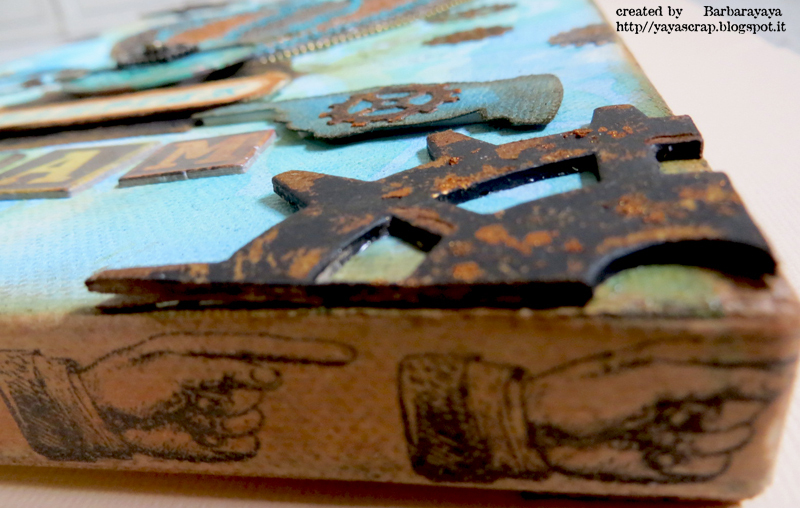 If you need any inspiration to get you going take a closer look at the DT makes and the fabulous project from our guest Barbara Yaya over here. Choosing our Top 3 was a hard job - as always! A huge thank you to you all for entering all your creative artwork to our challenges and sharing it with us! Congrats on your win, Kerstin! 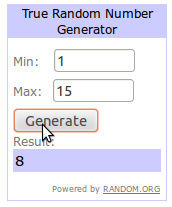 Please, email me for further details on how to claim your prize (e-mail adress is to be found on top of the side bar). We loved your projects, ladies! Please, feel free to grab the winners badge for display on your blogs! 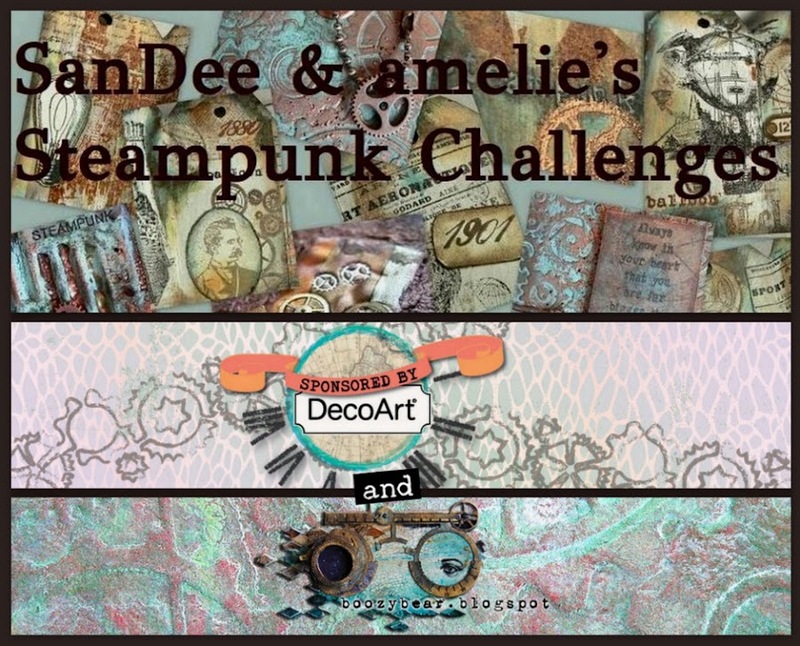 This time we also have a special prize sponsor whom we will announce in a few days alongside another lovely inspiring creation for this month's challenge "Your Favourite Technique Goes Steampunk". There will also be a discount code given for all those who would like to shop with our sponsor's online store. So make sure you come back to check it out on Monday! In the meantime: have fun creating and crafting! We hope to see you play with us soon! 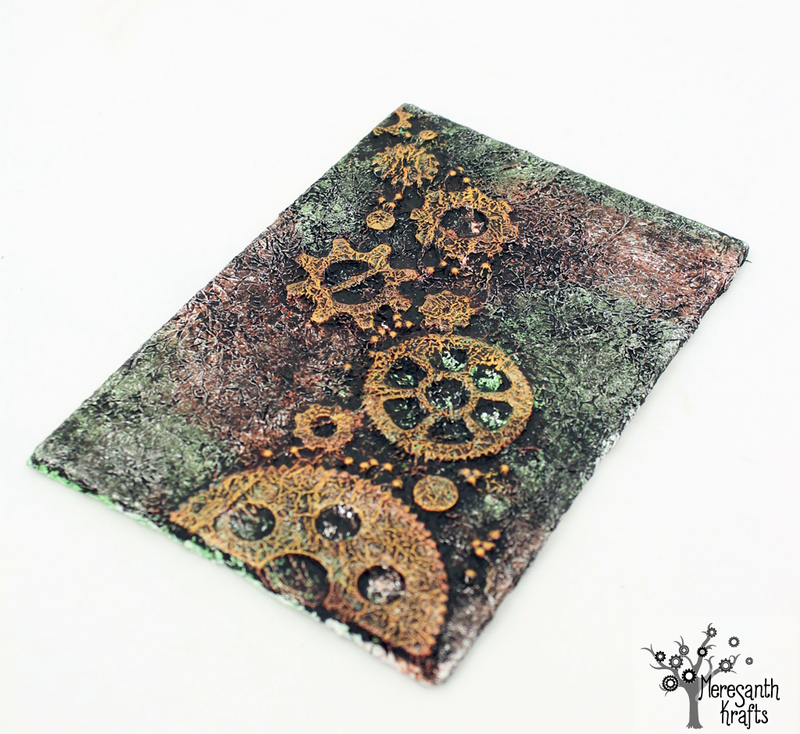 Your Favourite Technique Goes Steampunk! And the more we would like to thank our true and regular players who make this place so special! Top3 and prize winner will be announced on Saturday. Today we have the wonderful pleasure to have lovely Barbara from yaya scrap & more with us and she has created one of her fabulously vibrant and colourful makes for our challenge. Yay! I'm Barbara aka Barbarayaya on the web . I am very happy to be here with you! Thanks for this wonderful opportunity! I like to " play with the colors". My "artistic journey" began when I was very young . 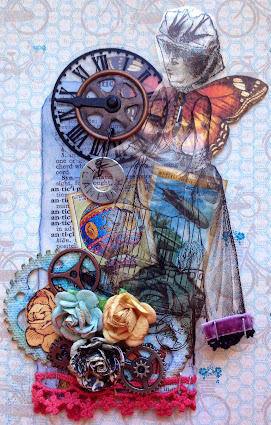 When I was five I cut pictures from newspapers and I did collages , with time going on I have traveled many roads : decoupage, cardboard , classic scrapbooking with photographs, card making . 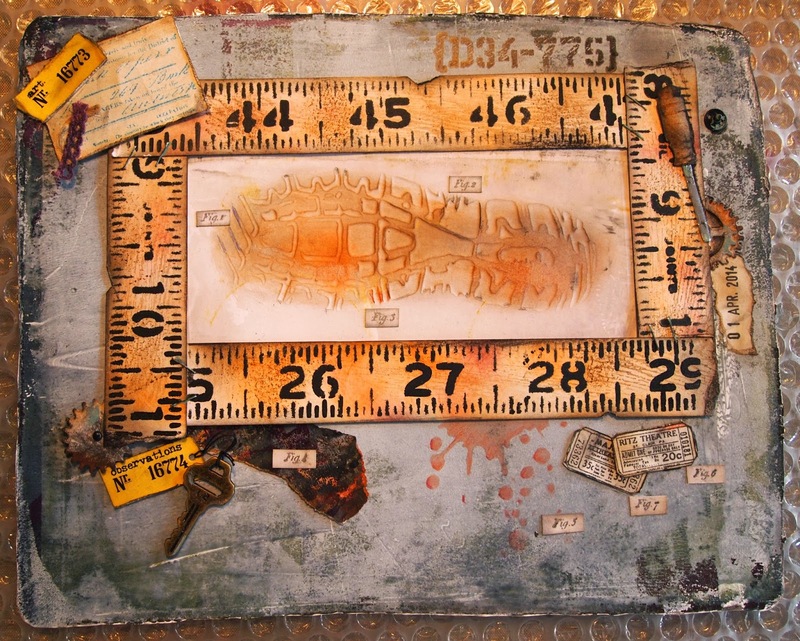 And finally I met Tim Holtz's art . And I realized that that was my road, his style is closest to my personality ! But my creative journey won't stop : I like to experiment constantly with new styles and my second love is for everything vibrantly colored and very similar to Dylusion Art and I'd love to start my first Art Journal soon! For the background of my canvas I chose to work with gesso and Distress stains and then use a themed stencil , at this moment I would say that the technique with stencils is my favorite!!!! 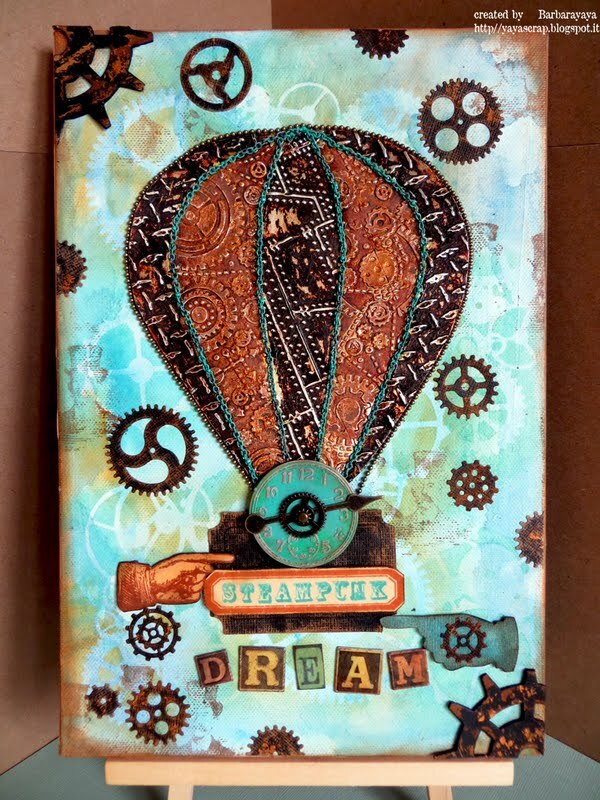 I love to use them with almost everything: spray paints, modeling paste , gesso, distress paints....I hope that you like my " dream Steampunk "! Sooo brilliant, isn't it? Thank you so much for being with us, Barbara, and for creating this highly inspirational piece for our challenge! 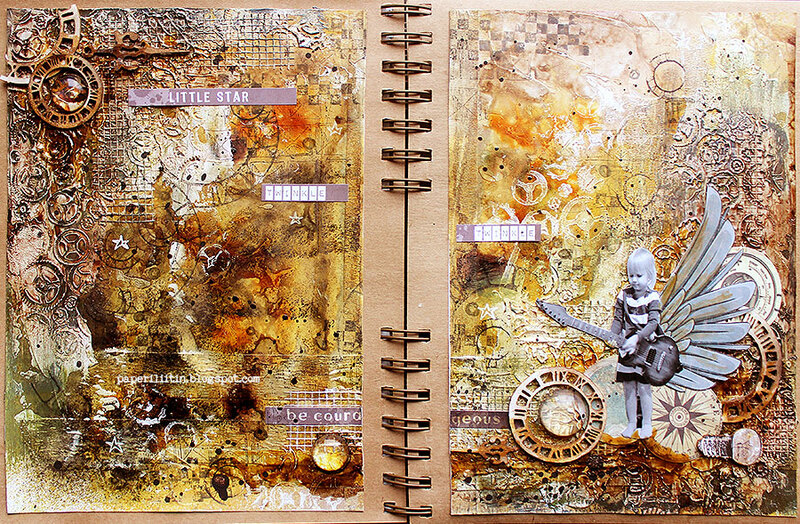 Double effect : I love altered books and I love Andy Skinner's techniques. 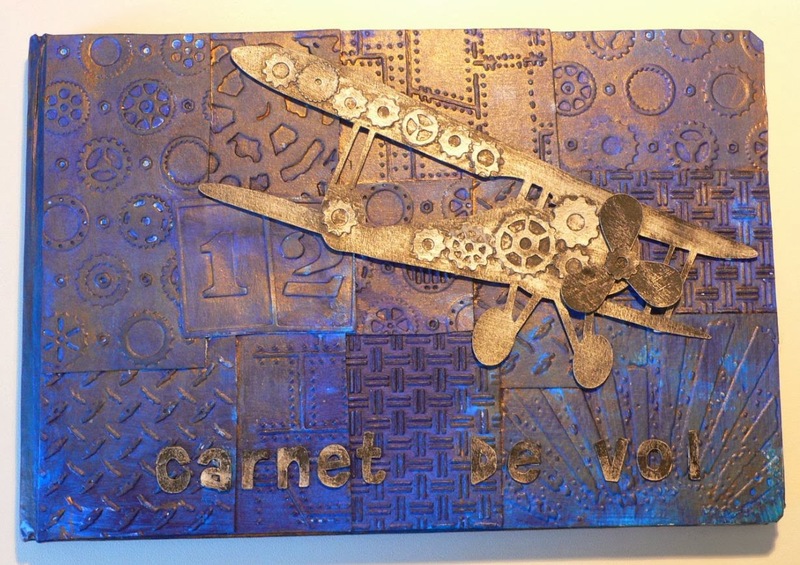 It's a "Carnet de vol" (flight book )- when you pilot a little plane you have a flight book. You write your flights, date, time....... I used a real old "carnet de vol" and added an airplane. After much deliberation, I have finally decided what my favourite technique is. 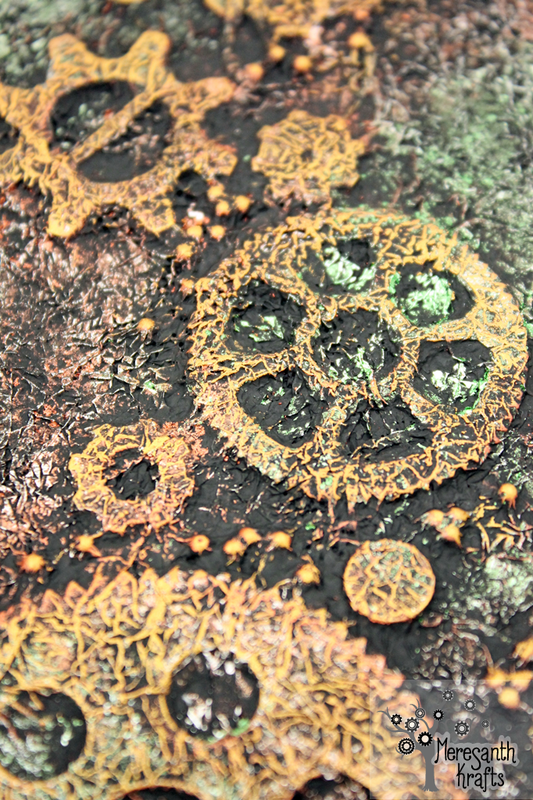 :) I created a 'distressed look' canvas using chipboards, paints and aluminium foil. I am so in love with the 'wrinkles' this technique creates! My favourite techniques include paper mache, using found objects and assemblage. All three were heavily used on this MMM (= moustache messieurs make ;). 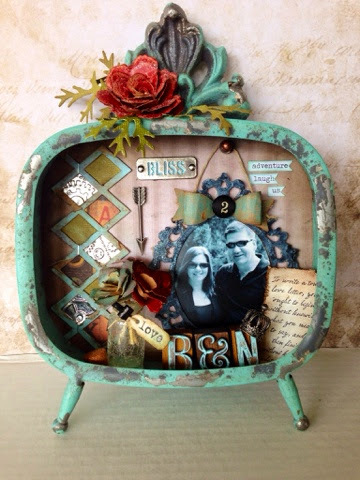 As always there is a prize to win besides getting spotlighted or making it to our Top3 - all you have to do is enter a make that follows the theme and our general challenge rules to either the 2D or 3D collection at the bottom of this post! We would love to see which your favourite techniques are!